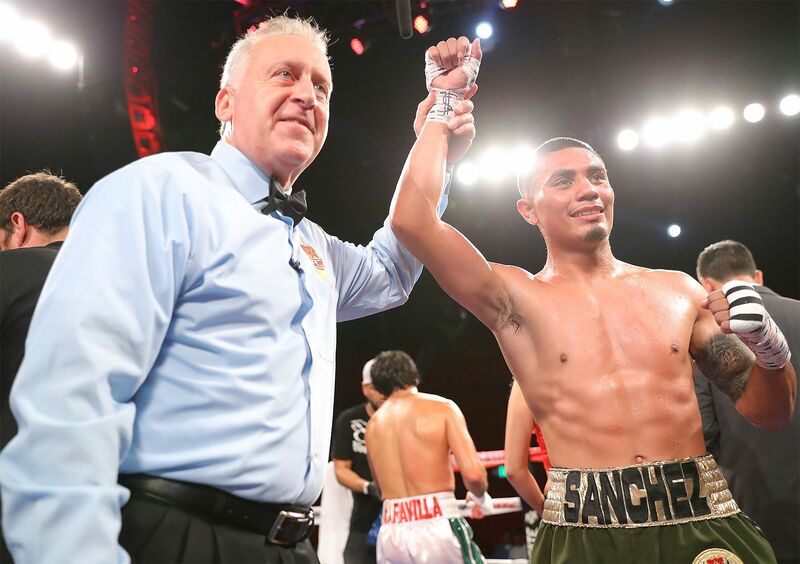 Emilio Sanchez (17-1, 11 KOs) made a successful move to featherweight by defeating Christopher Martin (30-11-3, 10 KOs) via fifth-round technical knockout in the scheduled eight-round main event of the Aug. 10 edition of LA FIGHT CLUB at the Belasco Theater in Los Angeles and televised nationally on EstrellaTV’s Boxeo Estelar. Sanchez dropped Martin in the third round and continued punishing him until referee Jack Reiss called a halt to the fight at the end of the fifth round. VIP guests for tonight’s event included Christian “Chimpa” Gonzalez, Manny Robles III, Marvin Cabrera, Herbert “Ace” Acevedo, Richard “Kansas Kid” Acevedo, Tenochtitlan “T-Dog” Nava, and Rafael “El Alikin” Gramajo. In tonight’s co-main event, Hector “El Finito” Tanajara Jr. (15-0, 5 KOs) of San Antonio, Texas defeated Emmanuel Morales (7-3, 4 KOs) of Cidra, Puero Rico via eight-round unanimous decision. Tanajara won with three scores of 80-72. Sanchez vs. Martin was an eight-round fight presented by Golden Boy Promotions. The event was sponsored by Tecate “THE OFFICIAL BEER OF BOXING” and Casa Mexico Tequila. The event took place on Friday, Aug. 10, 2018 at the Belasco Theater in Los Angeles. Mark your calendars and buy your tickets for the upcoming show on Oct. 12.